1 800 Homeopathy is a friendly resource of homeopathic remedies and products, information, research and contacts. They are a total resource to help you find homeopathic self care solutions you need for a healthier, simpler lifestyle. 1-800 Homeopathy has been in business for over 150 years making them one of the oldest self care solution companies in the world! 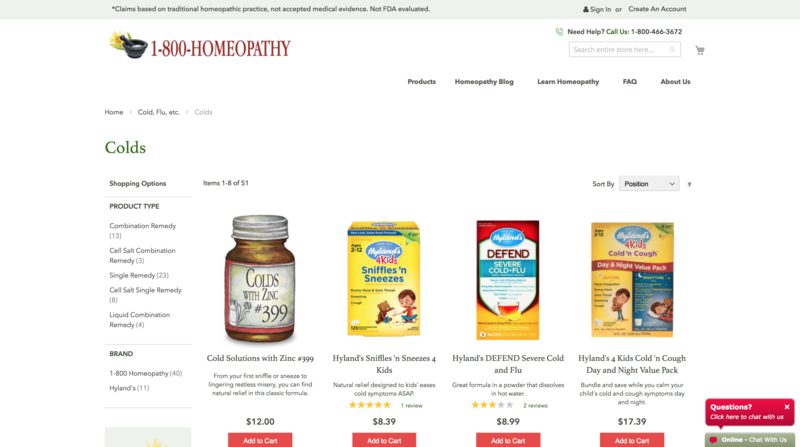 1 800 Homeopathy had an aging Magento 1 site that badly need a user experience revamp. Their traditional catalog company needed to innovate for the web but keep their roots at the same time. They needed to redesign the site, migrate their extensions and data to Magento 2 as well as add new functionality to support their growing needs. They needed an agency they could partner with that could take them to a more sophisticated eCommerce level. Trellis worked with 1 800 to redesign and rebuild the site on Magento 2. We were able to successfully bring over all their data and integrate with WordPress for some of their content pages. Additionally, we helped them vet all Magento 2 extensions so that they wouldn't lose any additional capabilities they had added to Magento 1. With a modern Magento 2 site, they can now scale and grow their business like never before!